A medical assistant checks the temperature of people from Democratic Republic of Congo (DRC) at the Ebola screening point bordering with DRC in Mpondwe, western Uganda, on Dec. 12, 2018. The Ebola virus is one of the world’s deadliest viral diseases. Now, a partnership of public and private organizations in the United States and Canada says it has found a combination of drugs that might treat the deadly disease. The Democratic Republic of the Congo, or DRC, is where scientists first discovered the Ebola virus in 1976. At that time, the country was called Zaire. The disease was named after the Ebola River where the virus was infecting people. Thomas Geisbert led the research at the University of Texas Medical Branch in Galveston. It was part of a public-private partnership that included the company Mapp Biopharmaceutical, the U.S. Army Research Institute of Infectious Diseases, and the Public Health Agency of Canada. Geisbert told VOA about the need for a treatment that would work against all forms of Ebola. “When an outbreak occurs, we really don’t know which one of those three strains, species, we call them, is the cause,” he said. He added that earlier treatments available had only worked well against the Zaire species. Geisbert said his group’s goal was to develop a treatment that would work for any form of Ebola. “If I have to make a drug that only works against Zaire, and another drug that only works against Sudan and another drug that only works against the Bundibugyo species, that is extremely expensive,” he noted. 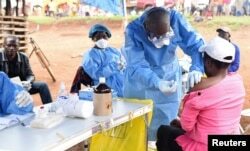 Geisbert said the new treatment will save valuable time in identifying which form of Ebola is spreading in an outbreak. He said it will save lives because people can be treated immediately, and it will also save money. Geisbert noted that there is not a lot of profit for the companies that produce the drugs because there is a very small international market for Ebola treatments. “So it really has to be sponsored by the government,” he said. Geisbert said the work ahead involves changing the amount of the drugs used to their lowest possible levels. That will make it easier to offer it to the public and to reduce costs. Also testing the drugs on humans must be carried out to ensure the treatment is safe and works well. Carol Pearson reported this story for VOA. Pete Musto adapted it for Learning English. Mario Ritter Jr. was the editor. How well do you think this new treatment will work in preventing the spread of Ebola? We want to hear from you. Write to us in the Comments Section or on our Facebook page.